On SYS episode 01, I’m telling the story of how Shift Your Spirits came to be. Back in 2002, over the course of a few months, my seemingly "ideal" life was systematically ripped away from me. I crawled out of the wreckage by listening to the voices of spirits and angels who were communicating with me. The directions they gave led me to rebuild my life into something more closely resembling what I'd always wanted it to be. So, true story. In 2002, at the age of 33, I had a stroke. You know that joke about ‘don’t give yourself an aneurysm’? Well, I did. I was working at the time at what I thought was my dream job. I was a student adviser at a university and I had also found an agent for the first time in my life for my fiction. So, on paper, my life looked, if not perfect, then perfectly suited to me. And, in a matter of months, it turned into hell. It all got pulled out from under me. On a Sunday night, I was out with some friends. I think we were at a bar or a restaurant, and then a club and anyway, I do remember hearing kind of a pop in my jaw, like a TMJ thing, you know. Like your jaw just kind of popping weird. And soon after that, my contact lens in my left eye just really started to torture me, so you know, I told everybody I gotta go home and get these contact lenses out of my eye. It’s Sunday night anyway, I’m working tomorrow. So I went home. And I woke up the next morning partially paralyzed. The entire left side of my face was sort of melted or frozen, and the reason why my contact lens had been bothering me apparently the night before is because my eye could no longer blink. So the paralysis extended down my neck and into my shoulder and kind of partially affected the fingers on my left hand. So, needless to say, I just wanted to go home and crawl under the covers, you know. And I started missing a lot of work because of this and I eventually did lose my job over it. And I became kind of a shut-in there, for awhile. So my name is Slade Roberson. For over ten years now, I’ve been a professional intuitive and the author of the blog ‘Shift Your Spirits’ where I try to write about spirituality with fewer hearts and flowers than the leading new age blather. 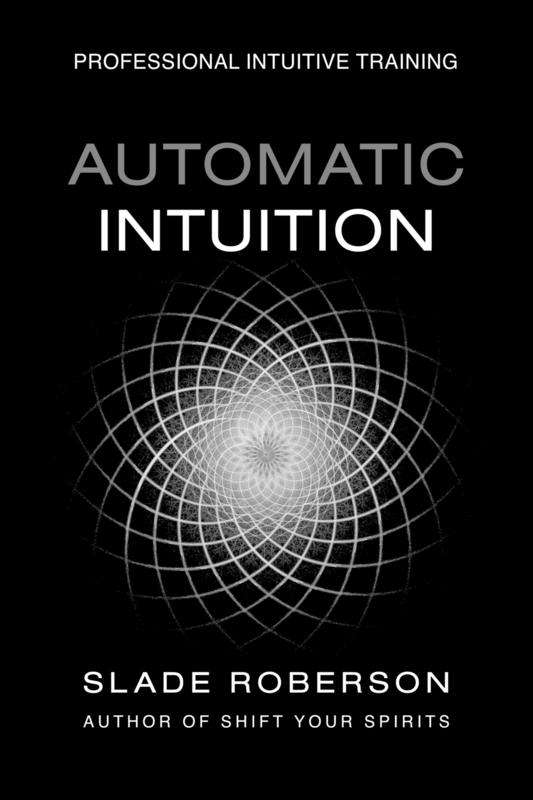 I also mentor emerging intuitives, psychics and healers in a program called Automatic Intuition. Today, I want to introduce you to my new podcast. And tell you a little bit about the origin story for ‘Shift Your Spirits’, how all this got started and where I hope to take it in the near future. So, after ten years writing for you every week, I want to do something new. Most of my job revolves around talking to you guys, one-on-one. I do intuitive readings, I go on other people’s podcasts, I do interviews with other intuitives to see if we can work together on my mentoring program, and I coach people to do what I do. So, you know, everything I do is talking. So why not, you know, record some of it and let everyone hear all the good talking stuff. It took me about nine months, maybe ten months, to recover most of my speech. Like, to get, I would say, maybe to about 90% recovered. And one of the things that the speech therapist advised me was to sing and to recite poetry because it does sort of use a different part of your brain and it also helps exercise those muscles and re-wire them as the nerves are coming back online to the cheeks, and the tongue, the lips, and everything. So, what ended up happening is I started to listen to a lot of rap and I would actually stand in the mirror for long periods of time and try to sing and annunciate the rap that I was listening to. And I credit Missy Elliot for being my speech therapist and a big reason why I recovered so much of the speech that I did. So, hey Missy, thanks girl! I did manage to get another job during this period. It was working for a guy who ran an online company and so there were really just one or two people working in this sort of warehouse space, and they were doing a lot of fullfillment for his online store. So it was pulling merchandise and packing it up, like a mini three-person-Amazon kind of scenario, and I also ended up losing that job. The guy was a little shady. I worked there for close to two months, during the end of the year, and I was promised to be paid for all that time that I’d been working on Christmas Eve. He wanted to get a lot of his Christmas sales and merchandise in to pay the few of us who were employees. So, Christmas Eve came and, of course, I wanted to go out of town and go home and visit my family and I went by to pick up my cheque or my money from him, and I found the warehouse locked. And it took several frustrating weeks to even get him to call me back and communicate with me. Long story short, he had no money to pay me. He never did pay me. And that whole experience actually was a big eye opener for me. I saw for the first time, how someone with a relatively small operation could run something online that looked like a big full-fledged business enterprise, and I do think that something clicked for me. And so I look back on that as a good thing that occurred, even though I’m still mad about the money that he owes me. What it did do was it made me mad as hell. And I came home from the holidays not having gotten paid for all that work that I did. And I thought, you know, I could do what he’s doing. Actually, I could do something better than what he’s doing because I wouldn’t deal with all this physical merchandise and stuff. I would just, you know, deal with writing content and possibly publishing, which is what I always wanted to do. So I took what was literally my last 35 bucks in my chequing account and I registered my own domain. And I decided I’m going to figure out how to do this online publishing thing. Remember this is 2003. So it took me a few years. I taught myself HTML, CSS, PHP. I literally just stayed in my house 24/7 learning to code. And at the time I was also still working with this agent on my fiction. And he had been talking to me about my platform as an author and we were trying to come up with some type of non-fiction part of what I did, to create an opportunity for me to teach and to possibly write a column, to do something that was in coordination with the fiction. So he had read all of my fictional stories and he was like, you know, there’s a theme. All writers have a story that they kind of keep telling over and over again and you definitely have one. And I was like, really! Okay, well what is it? And he said, all your characters are Joan of arc. They all have the ability to hear these voices, or they have some kind of psychic ability, and they’re socially outcast for it. Or they’re persecuted in some way. So what’s all that about, he asked me. And you know, so I told him. He was the first person that I told. What I never really mentioned to anyone else in my life up to that point. Because I was afraid people would think I was insane. I told him that I hear voices. That I hear spirits around me and I communicate with them. So, while he was trying to find me a column where I could write some of this non-fiction stuff, because he did see a bridge between the paranormal elements and my fiction that I was writing about and this real thing that was happening to me. But, of course, I had discovered this thing called blogging, which was a new kind of website, and I was experimenting with it. I was teaching other people how to blog. That was really sort of starting to become an income stream for me, or job, for me at the time, with all the skills that I had learned around self-publishing. So I decided, you know, I’m just gonna make a blog. I was doing it for all these other people, you know, these businesses that were hiring me to develop email marketing programs for them and blogs and I was teaching them how to use it. I was setting everything up, and they just really never seemed to do as much with it as I knew that they could, and it was frustrating to me that I was going to all this effort to build these beautiful little scenarios online for them to market themselves and put themselves out there, and they just didn’t do anything with it. So I started to become a little insecure that maybe I didn’t know what I was talking about. That maybe, you know, I was wrong about my strategies for developing online content and marketing it and getting people to pay attention to it. So as an experiment, I’ll take these articles that I’ve been writing for my agent about my paranormal experiences, my experiences as a child growing up, seeing and hearing things, and just all the stuff that I was writing about. The guides. I thought, I’ll just do an experiment and create a blog with that stuff because there’s nothing further from business-like than a blog about paranormal experiences and I just wanted to see if I went through the motions of pretending that I was my own client, and I built the blog and I did it as frequently as I was supposed to, and I did the email capture form, and I had a subscriber incentive. All this stuff that you’re supposed to do online to build an audience. What if I just do it, and just see if it works as well as I think it’s going to. And I actually didn’t think it would work. I, kind of - a part of me was still very much in the closet about all this and very shy about anyone knowing about it or hearing it. So I sort of tucked it away under a sub-domain on my web presence, and I thought, you know, I’m just going to stick this here, and maybe I’ll get enough of a trickle of interest that it’ll give me the data to sort of see if this works. And the name for the blog, Shift Your Spirits, really came to me fully formed. It was one of those things that my guides said, here’s the name of your blog. And I thought, okay, that’s cool, that works. So I slapped that name on it, and it wasn’t even like, ShiftYourSpirits.com. It was just my own, one of my business domains with this weird little folder tucked off to the side where no one would see it. So, this other weird thing happened around that same time. I started finding these books left in strange places, okay? So, I remember one time going out to my car in the middle of the night because I would go grocery shopping at like, 2:00 in the morning so that I wouldn’t have to see and encounter a lot of people. It was a vanity thing for me. I was wearing this eye patch, and my speech was slurred, and I just didn’t want anyone to see me. So I would go to Kroger in the middle of the night when there were, like, three people working there. And I came out to my car and found a book on my windshield. And it was called “Messages from Mother Mary”. And it was this little book about people who had seen and heard the Virgin Mary. And, okay, so there’s a whole Virgin Mary sighting experience that I have which I have to tell you on another episode that happened around this time. So we’ll come back to that, I promise you. It’s, like, one of the big stories that I want to tell. Anyway, so not long after that, I was living in a second story loft that had kind of a balcony outside of it. This place was almost like a prison. It was gated. It was very hard to even get into the parking lot, let alone get at any of the individual apartments. And so I had this balcony that you could only get to from, you know, going through my apartment. And I heard a thud one day and went outside and found a book on my balcony, like someone had tossed it up over the railing and/or dropped it from the ceiling, where the roof of the building, and it had just landed there. And it was called “Quantum Spirituality”. So anyway, more stories later about those books and their content. But anyways, so this strange stuff was happening, these synchronicities, and meanwhile I was writing this collection of articles. I had about twelve, which is what I usually advise people to do when they were starting out. You know, put out about a dozen, ten or so articles when you first start a blog, and launch it with a collection. And people started writing to me. Like, a lot of people started writing to me who had read these posts and were commenting on them, or emailing me and asking me if I could do a reading for them, if I could connect with their guides, or tell them what their guides’ names were. Things like that, and, at first I was, like, I have no idea if I can do a reading for someone else, but I’ll try! You know, and so I started writing these emails back to people where I would just sort of tune in and I would listen and I would get information from their guides or about their guides and sometimes the people would send me a question and I would tune in and get an answer for it and I would send it to them. And they were these really short little email readings that I started doing, you know, dozens of them every day. And this blog that I put out there, that I didn’t want anyone to see really, blew up. It became the single most productive, effective, successful blog that I’d ever created for anyone. All the mechanisms that I put in place were firing and I was building this subscriber list really quickly. I think, you know, after like a month, or six weeks, into doing this experiment, I had 800 people following my blog and getting their new post delivered to them in email. Fast forward nine, ten months later, I’ve been doing this blog and doing all these readings and, at that point, I had done literally hundreds of readings, and I just realized one day, I can do readings for people. And so I started to accept donations, and then I eventually started to charge for it. And I stopped being a web developer and just, kind of became a full-time psychic. So, I’d like to do some interviews on this podcast. My hope would be at least a couple times a month starting out. I’d like to have some guests on and let you guys get to know those people as well. So, if you are one of the people who’d like to be a guest on this show, by all means contact me. One of my best friends, Lacy, told me that she predicts that doing this podcast might actually go beyond my intentions of just simply flipping the writing into speaking, so I’m excited to see what might happen next. I certainly never intended for the last decade of my life to happen the way that it did. But it’s been the most rewarding job that I’ve ever had, and one that I would have never thought to do, had I not just put it out there. So I’m putting this next phase out there, which is Shift Your Spirits in audio format, and I hope you’ll tune in with me and come along, and see what happens. So, thanks for listening to this introductory episode. You can subscribe in iTunes or Stitcher or whatever app you use to access podcasts. If you’re new to podcasts, it’s probably that purple button on your iPhone. Click it, search ‘Shift Your Spirits’, and hit subscribe. Also, since this is a new podcast, it would really help me out if you would rate the show on iTunes and leave me a review. Share it on social media, tell your friends about it. It would make a huge difference in my efforts here and I would be extremely grateful.